HubSpot is a popular free CRM solution that is part of the HubSpot’s sales productivity suite and is linked to the same database used by HubSpot Marketing and HubSpot Sales. Together, the suite helps you to organize contacts, track tasks and deals, share documents, and, essentially, make your sales pipeline more efficient. How much does HubSpot CRM cost exactly? We can confirm that it is really available for free and fully functional, although you may really benefit from using the freebies along with the paid Sales Pro and Marketing Pro plans. We’ll explain in a bit why this can be a good decision. Even though it is available for free, HubSpot CRM is not simply a barebone version of the app as it is often the case with SaaS tools offered at no cost. In fact, even the free version of HubSpot gives its competitors in the CRM niche some tough competition (at the moment it’s used by 18,000 businesses worldwide). It is definitely a great way to introduce your sales teams to CRM tools with no initial costs involved. It will also work well if you want to get back to CRM basics after you got burned tinkering with sophisticated but difficult and expensive tools before. So, let’s take a look at what features you’re really getting when you get free HubSpot CRM. What Features You Get For Free? HubSpot CRM supports unlimited users which is really unique among other solutions of this type. For example, Zoho CRM comes free for up to 10 users and Insightly for 2 users only, while many CRM solutions support unlimited users only during a limited trial period. With HubSpot you’ll no longer be stuck with a paid plan only because you happen have a few more employees than predicted by the free plan. Aside from keeping basic information like contact details, HubSpot allows you to save pertinent information such as LinkedIn page, website, number of employees, annual revenue, and description in contacts. A record can be classified as a contact, company, or deal. If you already have a list of contacts, you can easily import a CSV file. What’s nice is the app lets you edit columns and properties if you want to maintain the column heads on your list. Once uploaded, you can see the contacts in a tabular format, which makes it easy to sort the list by name, email, phone, or lead status. We actually found HubSpot’s free contact management functionalities nearly comparable to Salesforce CRM contact manager plan, which is charged at $5 per user/mo and allows only up to five users. The app lets you add up to 1,000,000 contacts. However, keep in mind that the contacts you add in HubSpot CRM sync with HubSpot Marketing. If you use both apps, the latter charges you by the number of contacts in 100, 1,000, and 10,000 tranches. This is obviously not an issue if you only use the CRM module. Nevertheless, once you realize how much the CRM app speeds up your sales cycle, you’ll probably want to migrate to Marketing Pro for more contacts, and, eventually, conversions. If not, you can stick to the free CRM without any problems. HubSpot CRM gives you a basic sales pipeline you can easily customize to match your workflow. You can edit deal stages and properties, and set the default display. There’s also a filter for standard sorting like My Deals, Won Deals, and New Deals. That’s one of the very convenient features. Let’s say you move a contact to a new stage. The deal automatically syncs the life cycle stage in the contacts database. It’s efficient and useful to ensure all records are up-to-date. HubSpot CRM comes with a task scheduler that lets you assign and calendar tasks. A table format lets you track to-dos, calls, and emails across stages, defaulted at Not Started, In Progress, Waiting, and Completed. The columns are editable if you want to tag them differently. Likewise, with just one click you can view only specific users or all of them. Our estimates suggest the task interface works best for up to ten users; beyond that the tasks can get muddled a bit. By integrating with Gmail or Outlook, you can check the number of opened emails, clicks, and revisits after an email campaign. The statuses are laid down neatly in the Activity Stream. The limit to sending daily emails depends on the email provider. If you’re not using neither Gmail nor Outlook, you can send up to 500 daily emails straight from the CRM. The good thing is, the emails you send through CRM are not counted toward the limit in HubSpot Marketing. The free version allows for five templates only. For more templates you have to subscribe to Sales Pro. This is quite important, as flexible templates not only save you time from writing repetitive emails, but the CRM app can gauge which template is giving you more customers. Even if you only have five free templates at your disposal, that’s usually enough to A/B test a first-touch email. Or, you can use the other half of free templates to test follow-up emails. It’s a great way to hack this free tool. Once your mailing list grows and you decide you need a larger number of templates, the Sales Pro plan will always be available. 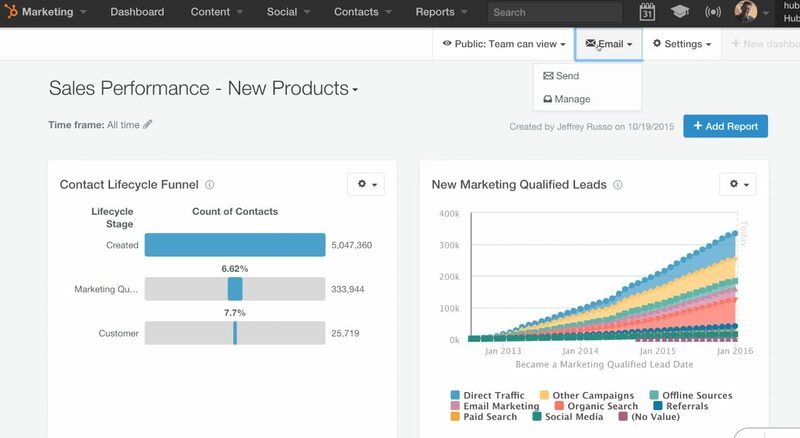 HubSpot CRM allows you to upload and track performance of up to five documents. It’s not much, but good enough to see the potential of this tool in online campaigns. Upgrading to Sales Pro will increase the cap. You can measure shares, total visits, and length of visit per document. Documents are limited to presentations and PDFs, an area that the vendor can still improve on. This is one of the more important freebies you get. You can embed a HubSpot code to track visitors in your site. You can see which companies are checking you out in real time (provided they have a digital footprint). This helps you to zero in on prospects that are currently interested in you; thereby, increasing the chances of conversion. The free version lets you place calls right from the browser with just one click. It also connects to your phone in case of poor internet connection. You can only call up to 15 minutes per user/month in the free app though. So, it’s more like giving you a taste of a good feature. For more calls you will need Sales Pro. You can also easily record the call and create a call queue if you need to. You can access the HubSpot Community for FAQs and tips. The community has robust knowledge base and searching for answers is as simple as typing a question. The community also connects you to other professionals who are using HubSpot, so you can share best practices. The free version allows for smooth API integration but is limited to 160,000 API calls per 24-hour period. For a higher cap, you can upgrade to paid plans. In summary, HubSpot CRM is an excellent choice for sales teams that are starting to adopt CRM tools. Small and medium business using traditional sales structures will also find the app very efficient. If you’re interested in trying it out you can easily get HubSpot for free here. Thanks for this write up, it is the clearest I have seen and helped me understand the Hubspot free CRM. I’m starting out and tossing up between Hubspot vs Insightly + Yesware.